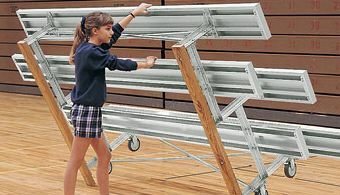 This 7.5 foot Tip and Roll portable school bleacher features 3 rows with seating for 15 people. 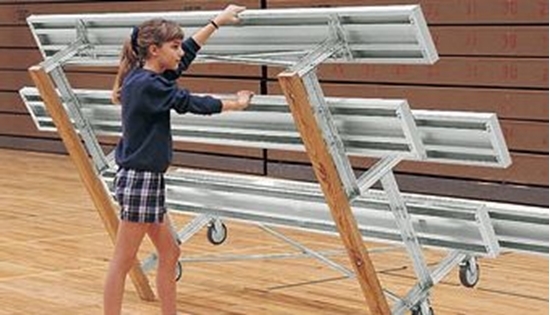 Made for portability and convenience, this bleacher can be used anywhere that is needed. Features 2 x 10 aluminum blanks and a bolted aluminum frame. The 7" rise per row is comfortable for adults and children. Comes with a set of four no marring 5" casters with brakes preventing any markings on the floor. 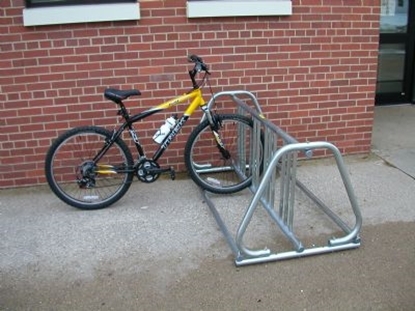 Picnic Table, Rectangular, 6 foot Aluminum with Galvanized Bolted 2 3/8 Inch Frame, Portable, 108 lbs. Bench with Back 6 Foot Aluminum with 2 3/8 inch Galvanized Frame, Portable, 80 lbs. Square 40 Gal. Concrete Trash Receptacle with Plastic Bonnet-Push Door Top and Liner. 600 lbs.